When you have children, one of the biggest challenges is making sure that your child eats all of the food that he or she needs to grow in a healthy way. Healthy eating is important from birth! If your child doe not get the right nutrients in his or her food, it is possible that his or her growth will be stunted or that he or she will become ill. However, if you have a child, than you also know that getting your young one to eat healthy foods is many times met with resistance. While it is easy to get a child to enjoy chocolate cake, broccoli is another issue! Here are some tricks and tips to helping your child get all the nutrients he or she needs. A great way to teach your children new skills as well as get them to eat healthy food is to get them to help you in the kitchen. Children as young as three and four love to help with simply things like stirring and pouring, while older children can learn to crack eggs, measure ingredients, and teens can even help to cut vegetables and cook entire meals. When a child sees what is going into food, he or she will be more likely to eat it. Children also will be more likely to eat foods that they help to cook because they are proud of their accomplishments. Another great way to get a child to eat healthy foods is to look for kid-friendly options. For example, if your child is not getting enough dairy foods, low-fat string cheese is a healthy snack option that is also very fun to eat! You can also find crackers that come in kid-friendly shapes and finger foods. If you are extremely worried about your child getting enough of the proper nutrients he or she needs for daily life, you can also find vitamin supplements to help your child’s diet. A number of brands makes vitamins that come in fun shapes and sizes so that you can convince your child to take them. There are also powered drinks and other enriched foods you can give to your child in order to make sure they get all of the nutrients they need. The bottom line is that you need to make sure that your child is staying safe and healthy, no matter how picky they may be. If you child refuses to eat a specific food, he or she probably simply does not like that food, and you should provide another choice. However, if he or she is refusing most foods, you must be firm about eating nutritious foods. Talk to your pediatrician in order to find out proportions and types of foods that your child should be eating. 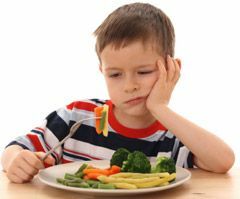 0 Response to "How to Get Picky Eaters to Eat Healthy Foods"